The cover to Superman V1 #252 (1972) may be my favorite Man of Steel cover of all time. 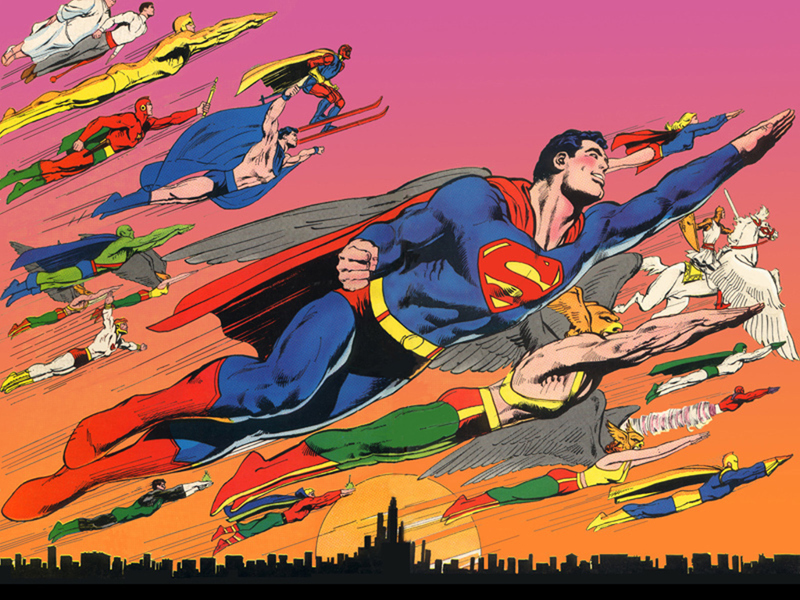 It's a great display by Neal Adams, showing the heroes of DC Universe flying off into the horizon. The cover scan is imperfect because of the square-bound nature of this 100 page giant comic, but it's still impressive. 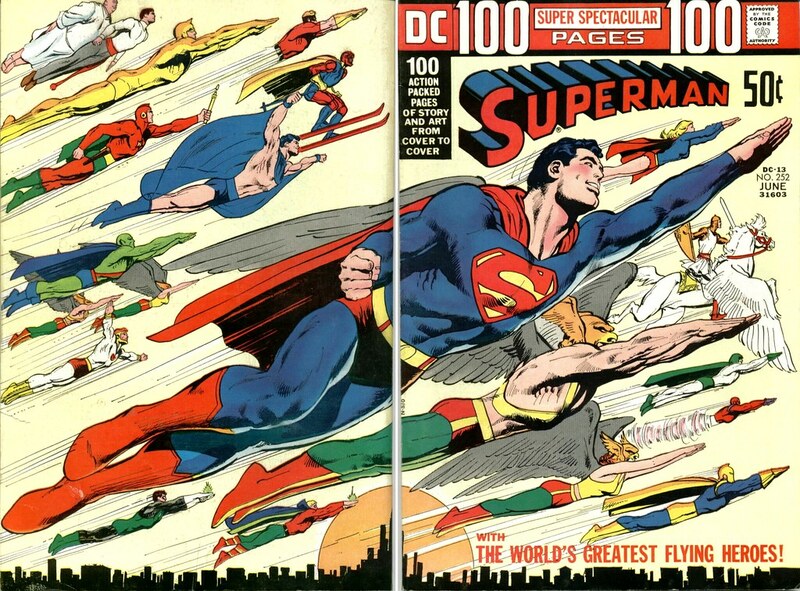 The way Neal Adams posed Superman was so perfect that it was used on other covers and products. The Golden Age DC Heroes, who were featured in the majority of the reprints. Spectre! Shining Knight! Silver and Golden Age Green Lanterns! Doctor Fate! The Ray! Johnny Quick! It was the first appearance of Roy Thomas' All Star Squadron. Ok, only in my imagination. Neal Adams included two Jack Kirby characters: Black Racer and Lightray. The New Gods had arrived! It's the cover a 100 page Super Spectacular and it only costs 50 cents. Multiple bonus point multiplier!!! Here is another version of this cover, without the logo/copy and re-colored to make the sunset effect more pronounced. I have no idea where this version was published; I give credit to FanPop for the image. I suspect it must have been used in a DC Calendar. If you have an idea, please let me know. 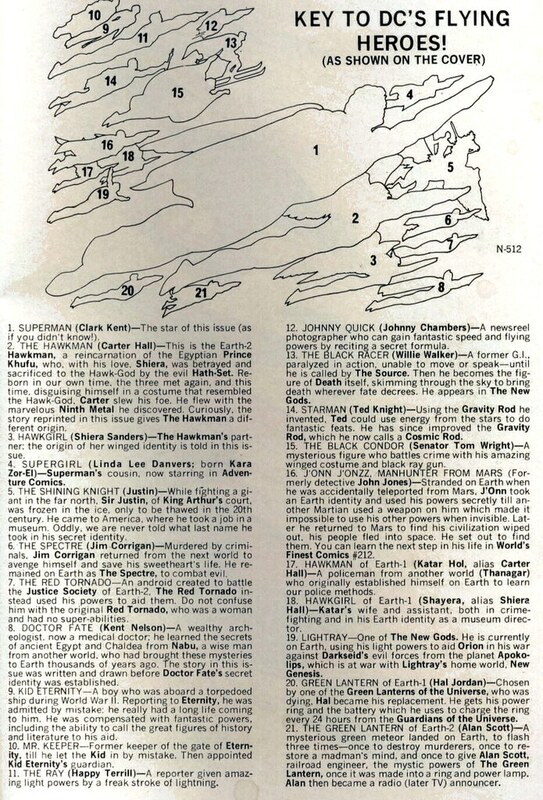 The inside back cover of Superman #252 had the index key to the flying heroes. I went over this many times, figuring out what hero belonged to Earth-1 and the Justice League, and which heroes belonged over on Earth-2 with the Justice Society. Which heroes were the dead ones? And what heroes were powered by magic versus science? 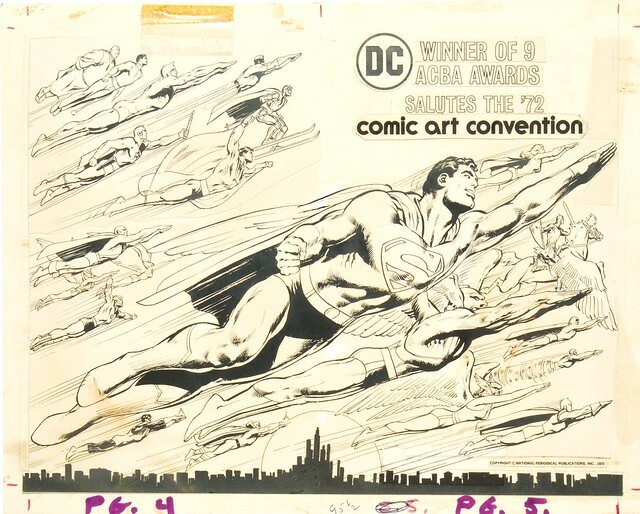 Update: Here is a scan of the original art used for Superman #252. Obviously someone at DC Comics took off the original logo and pasted in a salute to the 1972 Comic Art Convention. I own a copy of this now, but back in the 90s, I had trouble recalling the issue number. I went to the Usenet forums (pre-Internet days, yeah, I'm frackin' ancient) and vaguely described the cover. I thought no one would be able to help me. The answer came within an hour, and the guy who replied was a complete shock. It was none other than Marvel's own Tom Brevoort! A walking encyclopedia of comic history who doesn't hesitate to help a Dude in need. Thanks, man! Nuff Said!